The cosmic ray detection can also be done with a normal gamma spectrometer with the classic NaI (Tl) scintillator. The above picture shows a simulation made by a Montecarlo method in which we see how the calculations predict a peak at energies greater than 10 MeV, due to the interaction of muons with the scintillator crystal. For good results, however, it is necessary to use a fairly large crystal and collect the data for a long time (12-24 hours). We used a 63×63 mm crystal sensor positioned vertically and powered at 500 V. The description of the device is in the post: DIY Gamma Spectrometry. We utilized the software application BeqMoni which is suitable to make countings. 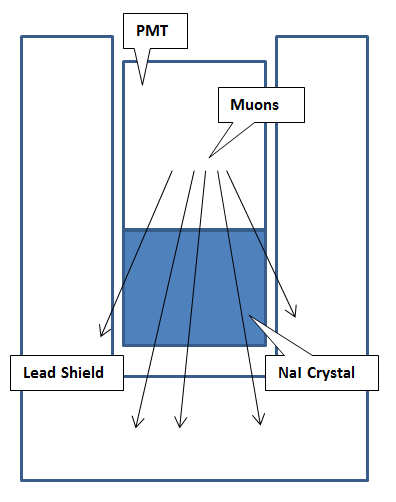 A muon that crosses the NaI crystal deposits about 4500 KeV of energy per centimeter, a muon with vertical path deposits then the maximum energy of about 4500 x 6.3 cm = 28 MeV. Of course not all muons follow the same path: some passing diagonally deposit more energy, others and are more in number, interact with the crystal with a shorter path and thus deposit less energy. The picture below shows the layout of the apparatus. The images below show the background gamma spectrum after a few hours of detection. At energies greater than the background peaks at 1460 KeV of K-40, at 1764 and 2204 KeV Bi-214 (from U-238) and at 2614 KeV of Tl 208 (from Th-232), the number of counts is reduced a lot and then peaked at about 28 – 30 MeV. This peak corresponds to the energy deposited by the muons interacting with the scintillator. By utilizing the BeqMoni ROI feature, we made the count on the muon peak, obtaining a value of 0,42 CPS – 25,2 CPM, as shown in the figure below. For energies below the limit of ROI, we find also muons whose path only partially meets the crystal and therefore yield a lower amount of energy, and there is also the “soft” component of cosmic radiation (gamma and electrons) that corresponds to lower energies. In the figure below, we have extended the ROI to 4000 KeV, obtaining a value of 0.9 CPS = 54 CPM. This value includes the muons from a solid angle of 2π, thus also coming from the side and also the “soft part” of the cosmic radiation.